In the past most 125s were timber and amateur built. It is still possible to build your own boat, the Association sells paper plan sets with fully documented building instructions for $50.00. This charge also includes one year's family membership of the association. A basic amateur built 125 will cost about $5,000. A professionally built 125 will cost approximately $8-9,000 depending on fit out. Plans are available from the State Associations for building a 125 using the "stitch-and-glue" method of boatbuilding. Building with the stitch and glue method involves firstly "stitching" together the plywood panels using copper wire. Next the bulkheads are wired into place and internal members fitted with nails and epoxy glue. The "stitched" joins are then fibreglassed inside and out using fibreglass tape and epoxy resin. Finally, the decks and gunwales are fitted with epoxy glue, and the hull is ready to paint. The plans are supplied with full size paper patterns for the plywood panels, and step by step building instructions. The Building Instructions have been recently revised and contain techniques used by experienced 125 home builders to build strong light hulls. The State Associations also supply aluminium mast, boom and spinnaker pole sections as well as aluminium rudder box kits and mast steps. Building a timber 125 over winter can be a very rewarding experience, and the majority of timber 125's have been home built. Australian enquiries regarding plan sets should be directed to the state measurer in your state. Please refer to the contacts page for the your State Measurer. International (ie outside Australia) enquiries should be directed, via email, to the National Measurer. 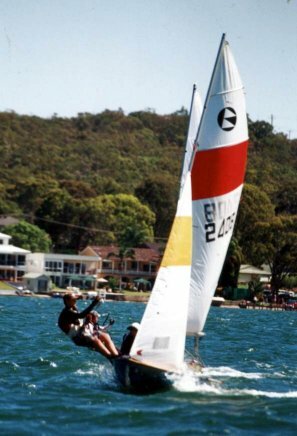 A second hand timber 125 can cost as little as $500 and for that modest investment you will get a boat that will work as a fun introduction to sailing for the family, but will be pretty old and basic, perhaps in need of some tender loving care. For between $1500 and $2500, you can buy a good sound timber boat, on a road trailer with reasonably good sails and fairly up-to-date fittings. A boat in this price range will be a good first 125. It might need new paint, maybe a new sail or two if you get more serious about racing. These boats will usually be between 55-65kg but still quite competitive. $2500 - $4500 will buy a very good timber boat perhaps only a few seasons old, closer to minimum weight. A boat at the upper end of this price range should have very good sails and perhaps a good race record. Second hand foam sandwich/fibreglass boats are not as common as timber due to their having been available for only four years or so. The earlier foam/glass hulls were a little bit heavy, between 55-60kg, however, they are very stiff and perform very well. The more recent foam/glass hulls are strong and close to minimum weight. At the present, a second hand foam/fibreglass 125 with trailer will sell for between $5000 and $6500. To find boats for sale, see the Classifieds on this site, or contact the State Association in your State for a list. 125's are also advertised in "The Trading Post" newspaper and on yacht club notice boards. Measurement Certificate - Has the boat been measured? (The boat should be measured, if not ring the measurer and ask to check the 125 Association's records. Who is the Builder, who made the Hull? Check the Hull, particularly the bottom for cracks etc. Is it painted inside? Sails - Brand, Age & Condition? Main, Jib & Spinnaker? Trapeze -does it have a trapeze fitted? Traveller - type, does it have a ratchet block? Fibreglass tape seams - are they O.K.? lifting or leaking? Is mast fitted with spreaders for support? Type of Spinnaker launch? Chute or pouchs?